I have always had a passion of training dogs to do all kinds of discipline . In 1981 I got the opportunity to train and work with some great trainers. Doug Cohen a 20 year retired Police Officer allowed me to learn hands on all levels of K-9 training. We worked intensively with several breeds and really refined my skills to teach obedience training. In 1983 I began to really thrive and started to become familiar with teaching the personal protection dog for the home. Butch England and Jeff Leonard both professional dog trainers really were a crucial part of my development to love what I always had the passion for since 1981. In 1986 I opened a 5,000 square foot training facility in my home town Naples, Florida. 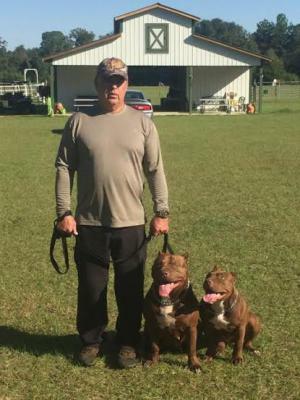 With the birth of Florida K-9 Academy I was able to offer all levels of dog training, boarding, grooming, guard dog leasing to businesses, and carried a full line of pet supplies and feed. I have been training all breeds of dogs and all levels of training for 34 years. I have trained K-9's for home, business and security company's. I love what I do with the K-9's and will love to help you with your pet.